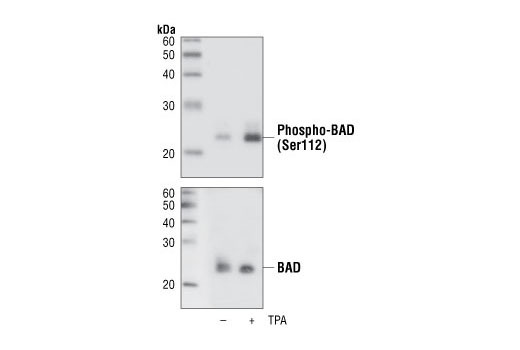 Western blot analysis of extracts from COS cells, untreated or TPA-treated, using Phospho-Bad (Ser112) (40A9) Rabbit mAb (upper) or Bad Antibody #9292 (lower). 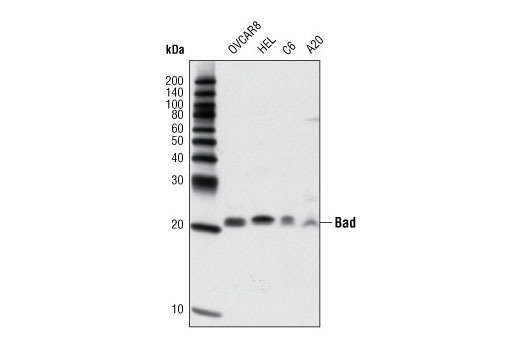 Western blot analysis of extracts from various cell lines using Bad (D24A9) Rabbit mAb. 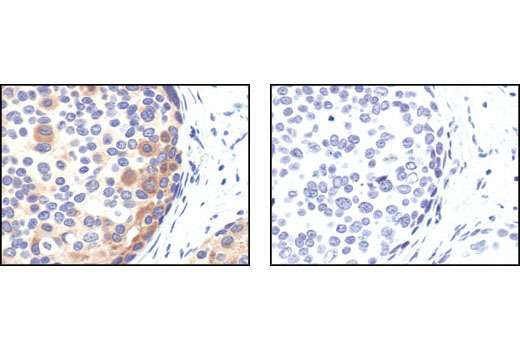 Immunohistochemical analysis of paraffin-embedded human breast carcinoma, untreated (left) or lambda phosphatase treated (right), using Phospho-Bad (Ser 112) (40A9) Rabbit mAb. 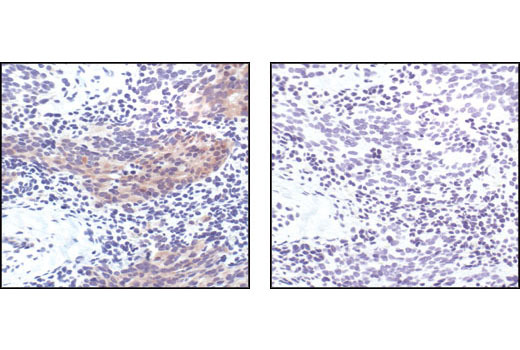 Immunohistochemical analysis of paraffin embedded COS cells untreated (left) or TPA-treated (right), showing induced cytoplasmic staining using Phospho-Bad (Ser112) (40A9) Rabbit mAb. 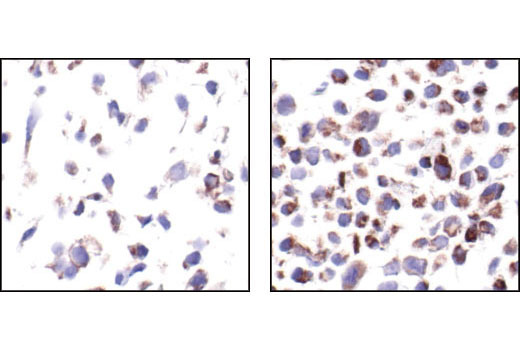 Immunohistochemical analysis of paraffin-embedded human prostate carcinoma, using Phospho-Bad (Ser 112) (40A9) Rabbit Monoclonal Antibody preincubated with control peptide (left) or Phospho-Bad (Ser 112) Blocking Peptide (IHC Specific) #1026 (right). 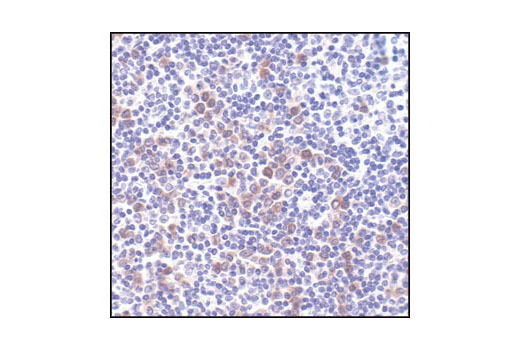 Immunohistochemical analysis of paraffin-embedded Non-Hodgkin's lymphoma, using Phospho-Bad (Ser112) (40A9) Rabbit mAb. 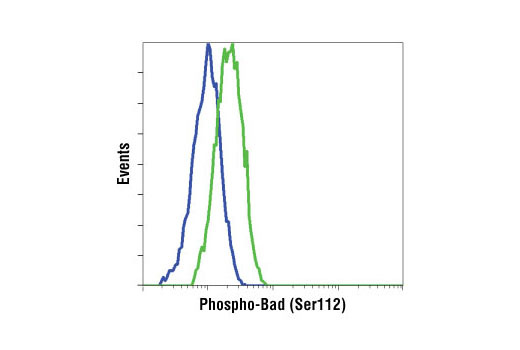 Flow cytometric analysis of COS cells, untreated (blue) or TPA/Calyculin A treated (green), using Phospho-Bad (Ser112) (40A9) Rabbit mAb.